Congratulations on your massive victory and assuming the role of India’s Prime Minister yesterday. Over a billion people now have their hopes associated with you. This note is to share some observations on an emerging social phenomenon and some ideas on how citizen engagement with Government can drive good governance and India’s transformation. Two weeks ago, some visionary members of your party Communications team started an online community so citizens can give inputs as a community on the immediate and long term priorities for the Government. The result has been truly amazing; Over 30,000 Indian citizens from various backgrounds (from farmers to small business owners and from CEOs to housewives, young and old) coming forward submitting views, interacting, debating, offering to volunteer and constructively contributing for their India. The online community in two weeks has received over 35,000 posts and comments and 99+% of them are constructive, valuable inputs. Just imagine 30,000 of our Indian citizens in a virtual room, using respectful language, not trying to sell their services to each other or asking for jobs, but contributing their best to solve the problems of India. From talking about how to clean India to solving the problem of corruption and from creating jobs to providing drinking water and food for all, they have collectively identified ten areas for the immediate term and ten areas for the five year term where they would like the Government to take actions. This is not the usual sloganeering, but India of today wanting to engage with its Government and doing its bit to make the Government work better. In the coming month, this community plans to undertake a detailed review of each of the areas, root cause issues, and collectively develop solutions for it. Sir – You have effectively demonstrated the use of technology and social media in your election campaign like none other. If we use the same technology and social media to engage citizens and enable them to participate, we have a transformational opportunity that hasn’t been available to anyone in history. Let us engage with citizens for national as well as local governance and development through online communities like the one above. On the national front, we can know about the exact challenges citizens want addressed, crowd source solutions and even engage citizen volunteers with the Government to solve them. On the local front, by connecting citizens in a particular constituency and their elected representative in an online community, we can enable them to easily come together to work on common issues like sanitation, safety, water or roads. 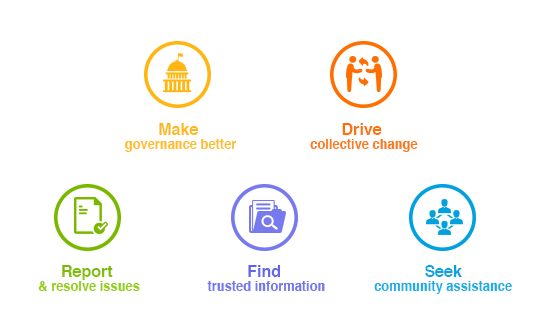 We could even take this approach to Government departments by creating a citizen community for every one of them, allowing them to seek feedback on policies, issues, work done and areas needing attention. Such an online community based approach will make the Government work with citizens, empowering everyone to report, share and participate easily. It will make the Government efficient and the citizen daily life, easier. Some within the Government may have reservations early on against adopting such a community oriented open governance model as it will drive accountability. However, we must educate, persist and still implement it. Over time, most will realize the value of staying connected with citizens, especially when they don’t have to spend as much in the next election to connect with their constituency. In our history as independent India, we have not had a Citizen Oriented Government. What Indians see different this time through you is a strong leader who generates hope, has the conviction and at the same time a desire to serve and work together. That is driving the urge to participate. Thanks to technology, participation can now start on fingertips. If we can build on this foundation and positive momentum and engage our citizens with the Government, we will be able to make “Sabka Saath, Sabka Vikas” (Collective Effort, Collective Progress) a reality. Let us engage every Indian with India! 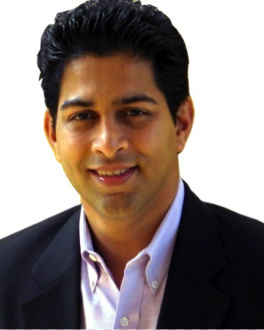 Sachin Taparia is the Co-Founder and Chairman of LocalCircles.